First and foremost: IS IT CANON? Not yes or no - a (online) confirmation by Marvel authority is necessary. • Arctilan is re-relocated on The Moon, maybe or maybe not in Blue Area for unexplained reason. • Black Bolt and Medusa are back to playing footsies. • Karnak, Crystal, and Luna are back together on site. Not clear if any other Inhumans have left Earth. • The less than fetching D-Man is still bay but has no powers or significant other any more. He has drinking issues and seems no longer connected to Team Falcon. 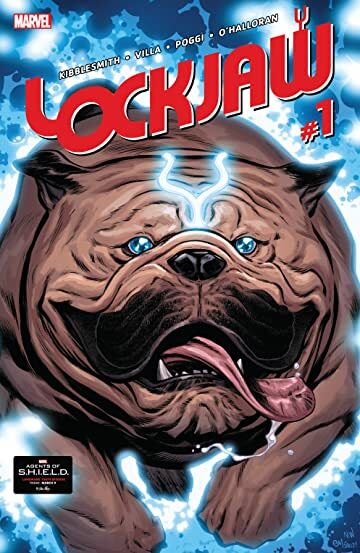 • Mrs.Gillespie, his neighbor, coincidentally adopted a stray pet dog which looks suspiciously like long neglected "Puppy" from Lockjaw/FF canon some time ago. There is definitely some sort of 30 year old connection that will be revealed. • Dennis has a sister with a boy's (or even a dog's) nickname. • The pair chase the Space Hamsters to the Savage Land where Lockjaw faces off against Zabu in very un-Pet Avenger fashion. It will be great to see that team confirmed as non-canon. Have the two animals ever appeared together in a book that didn't involve the Pet Avengers? I would love to Lockjaw fight Cerberus (the guardian of Hades) in his 3-headed dog form.